It's been awhile since I've strayed from photography-related posts. But we don't work in a vacuum: we need tools beyond DAMs, post-processing apps and lenses. Truth is, photography for me is often just as much about writing and organizing my thoughts/ideas than it is about shooting actual pictures—so in light of this, I wanted to share a recent change in this part of my workflow. Besides: it's Friday and I'm just moving everything around these days (!). In the Technicalities chapter of TKTS I mention that "my brain lived in Evernote" during the project; and so it did. Everything from sketches, to texts, to ideas, to outlines...it was all centralized in that application, allowing me to work across devices and keep track of everything on an ongoing basis. But as of a few weeks ago, I've moved into El Capitan's Notes. Here's the thing: I was never an Evernote addict. In fact, although I'd had an account since 2011, it's only in the past year that I began actively using it: I'd tried off and on a couple of times but never warmed to the interface on the Mac which I found overly cluttered. It's the—much simpler—iOS version that finally got me hooked. I even went ahead and purchased the premium upgrade...right before the company completely overhauled their pricing. I don't at all mind paying for services or apps. None of us should. I do however mind when prices jump all over the place, previously available features get bumped to higher priced tiers and offshoot apps get created with great fanfare only to be canceled down the road (a la Google). In my brief time as an engaged Evernote user, what I've seen has been confusing. It feels like a service in search of itself, with bugs going unfixed while new features are added; an inconsistent UI constantly in flux; serious problems when it comes to feature and UX parity across platforms and versions. But what irks me most is the hard sell: my premium account constantly nags about Work Chat and Context even though I've dismissed these in-app notifications time and time again. They’re recurring, intrusive and make me feel like there's always someone watching over my shoulder ready to sell me up on something—even though I'm ALREADY paying for it. I can't count the number of times I've had to dismiss one of these "informational” panes taking up half my iPhone screen when all I wanted was to write something down. This below? It appeared on my iPad this morning when I opened the app to take a screenshot of something else entirely. Got it you say? Yes, I so frickin' GOT IT. More importantly though, I've also experienced hard to pin down instances where attachments have simply disappeared after a sync. Isolated cases but it's not a very comforting feeling from an app whose sole purpose is to save stuff. And from a company who should be thinking of nothing else than saving its users' stuff. I've also seen formatting issues from synced notes, namely strange copy/paste problems severely messing up text justification in other apps, to the point of being unusable. I sometimes had to create temporary PDF files in order to get text that would behave normally, which seems to point to some sort of invisible character problem. And then small auto-correct glitches while typing…just all around weird and random behaviours that make the app feel unstable. In spite of all this, I still wasn't actively searching for a replacement. But during the El Capitan beta the new Notes app picked my inner-geek interest; I decided to investigate. Write: the writing experience needs to be simple. I just need the basics without distractions. Search: I need to be able to find anything quickly. Visualize: I'm a visual person. I like being able to glance over documents/images etc. Yes, Evernote generates thumbnails for notes. No, it does not work well. This is in fact a feature users have been asking for in the company's forums for ages and still hasn't been implemented correctly (I stumbled on these discussions while trying to understand how exactly the app was choosing images to display as post thumbnails). 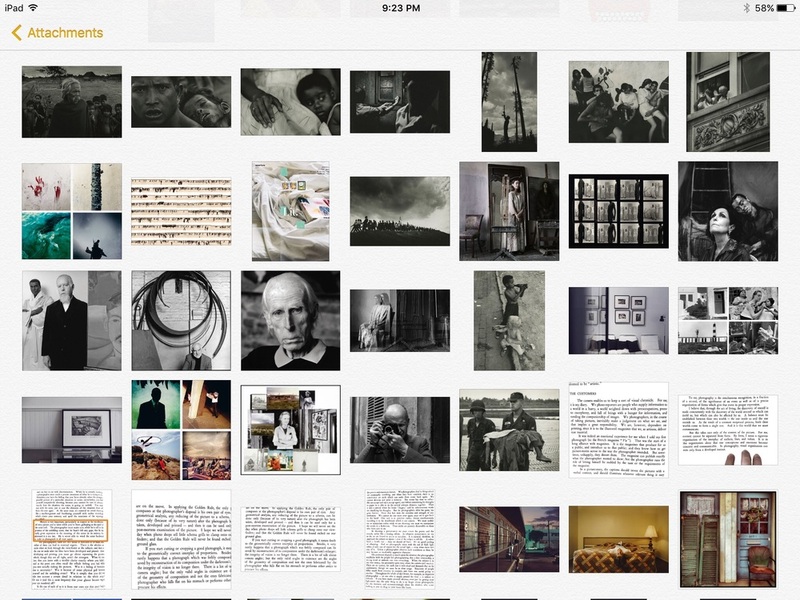 Notes on the other hand is like having my own personal Pinterest board: it shows ALL saved images, period. For a visual guy like me, this is a godsend. Admittedly, it CAN get polluted with logos and various unwanted elements depending on what you save—I sometimes need to clean up notes to prevent these from showing up. In an ideal world the attachment browser would allow us to display content from a single folder, not just the entire library. Yesss. Hats off to Larry Salibra for coming up with this script. There's a disclaimer on the page about possible corruption of the iCloud Notes file...so I was very cautious with it, exporting first a single note, then one notebook at a time, sometimes in batches. If I'd had thousands of notes to export this might have been a problem but in my case it worked extremely well: every notebook became a folder in the Notes app, all notes imported without a hitch. Well, some errors here and there with saved HTML pages but nothing essential to what I was trying to do. Again, I was fine with it given my own situation. I've now replicated my Evernote organization in Notes and everything's in its rightful place, with the added bonus that folders are actual folders: not just one-layer containers for notebooks. Which means they can contain other folders and so on...something I always wished Evernote could do. It's actually much more flexible in this regard. One of the recurring negative comment I've read about Notes is its lack of a tagging system. Totally true. And given OS X's ability to tag files, this seems like a missed opportunity. But here's a somewhat interesting "feature" I found through experimentation: 00. Let's call this The James Bond Trick™. By default any word in a note is searchable, so if I tap "photography" in the search field it'll return any instance of that word across all notes—potentially hundreds of hits. If, however, I add 00photography at the end of say, two notes, and then search for that string in iOS, it returns ONLY THOSE TWO notes. Not the ones containing either "00" or the word "photography". The app sees 00photography (or 00fuji or anything else for that matter) as a single word. And since I'm never going to type any word with 00 as a prefix: bingo. Tags. Sort of. But what about an asterisk instead of 00 you say? Makes more sense right? Tried it. Doesn't work and I don't know why. I'm sure other numbers or prefixes would but 00 is quick to type, easy to remember and does the job. One caveat however: I did notice that it can take several minutes for newly tagged notes to appear in a search. There seems to be a background update mechanism at work that isn't always as instantaneous as we'd expect. But hey: tags! The folders pane re-appears if the app loses focus. So If I'm writing full screen and switch to a thesaurus I need to dismiss it again when I come back to the app. But once more iOS 9 apps get Slide Over and Split Screen support this won't be much of an issue. Folders in iOS can't be closed/collapsed. They can be on the Mac. Folders in iOS can't be moved and there's no way to create subfolders. Again, this is possible in OS X. As previously mentioned, the attachment browser is always set to all notes. I'd love for it to also be able to show a single folder's content (a visual inspiration folder for instance). Type size in the OS X version is way too small. We should be able to set it as a general preference, not just on a note by note basis. There's no way to add the Notes app into an automated workflow a la IFTTT or Workflow. Not yet anyway. My one lingering concern? Getting things OUT of Notes if I eventually need to migrate. But I'm confident some other crafty developer is bound to create a solution eventually. Let's be clear: if you use Evernote reminders, context, work chat, stickies organization, business card OCR or any of the myriad high end Evernote features on a daily basis, Notes won't be for you. Evernote is much more powerful and this isn't likely to change. But we've come a long way since Marker Felt and the new Notes app is now a surprisingly agile contender in the field. P.S Launch pricing for my new book/album project These Kings. These Subterraneans. is ending this weekend. Just a heads up for those who are interested. Have a great one guys.